A couple weeks ago, I thought it would be genius to have the Princess try some mashed avocado. This seemed like a great plan because then I would know exactly what my kid was eating. It wasn't from a jar. And it was super low maintenance. Just mash it with a fork. Well, it turned out that I was a little eager in the solid foods department and she wanted to stick to some basics for a few more weeks. She has just started digging her oat cereal 2 and a half weeks later. She'll learn. 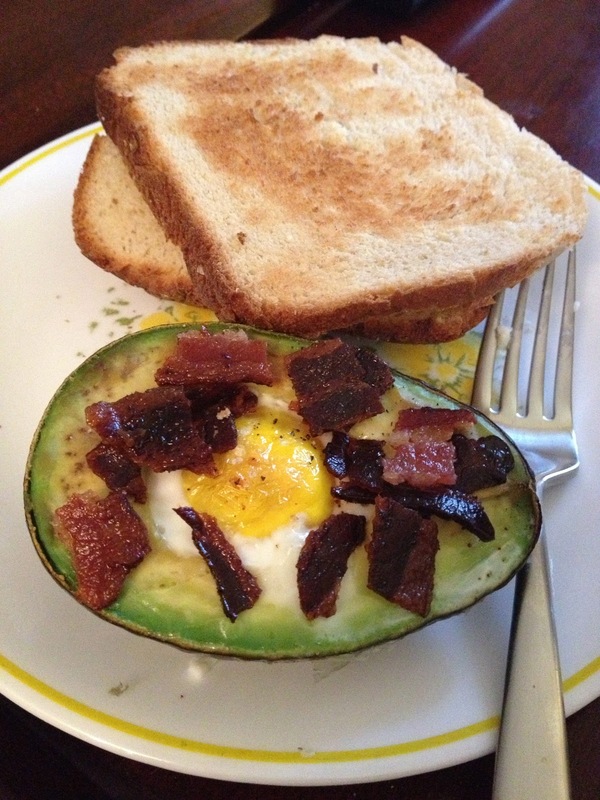 Turns out baked avocado egg is delicious! Top with bacon and it is even better! holy. crap. that looks AMAZING. I am obsessed with stuffed avocados in any form. Salena's restaurant in Rochester has a crazy good stuffed avocado on their menu, so next time you are home, you should go try it. Harrison had a hard time switching from jarred baby foods to fresh, too. The first time I gave him banana it was a pretty epic series of confused/frightened faces, but he likes them now!